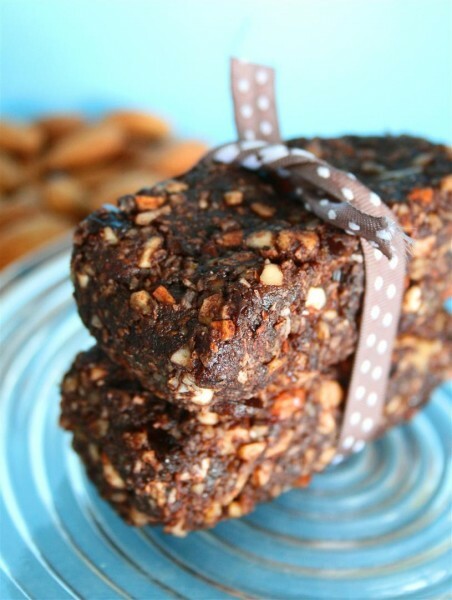 Chocolate Coconut Chew Lara Bars was posted on October 3rd, 2011 and is filed under Dairy Free, Desserts, Gluten Free, Protein, Recipes, Snacks, Vegan. This entry has 28 comments. You can follow any responses through the RSS 2.0 Comment Feed. I love Lara bars. Best travel snack evaaaa. They have saved my life many times. But I try not to buy them for my every day at home snacking rituals. It could get a little pricey the way I go through them. So I save my store-bought favourites for when I’m traveling (like now!). Before I left on this trip I made a huge batch of one of my favourite flavours…Chocolate Coconut Chew Bars. They are kind of amazing. I individually wrapped each bar in cling wrap, popped them in a big Ziploc, and dropped them in the cooler. 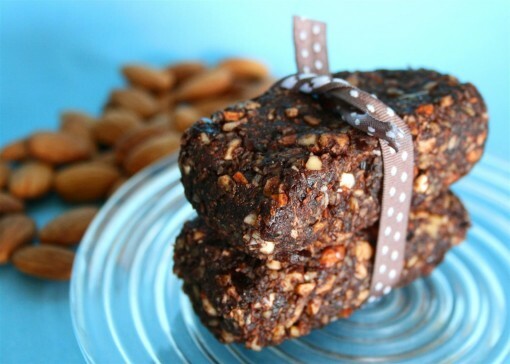 This recipe made about 10 bars…that’s 10 afternoon snacks right there! So easy to pop in your bag/purse on the way to work or school. The process is super simple…just whip all the ingredients up in your food processor, shape into bars, and walaa….all done. But I think it’s a good idea to soak your walnuts (and rinse) before you use them…it helps take away a bit of that bitter taste that walnuts often have. Tip: You can make bite-size versions of this by rolling the batter in small balls. I love doing it this way too. For this recipe, you could use any dates but I’m so in love with Medjool dates…they’re great big, juicy dates that are so sweet and succulent they’re really a dessert by themselves. Their flavour is distinctively caramel. 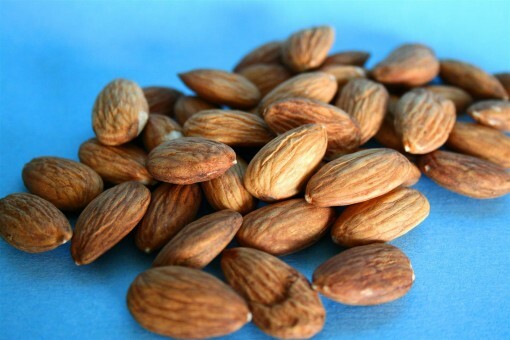 And I love almonds. Actually, something I used to do when I was craving something sugary, was to stuff a Medjool date with a little almond butter and then stick in a whole almond. It really does taste fantastic, like a raw version of a little mini date pastry. What is your favourite Lara bar flavour? Maybe I can try to recreate it sometime! Any other bars you love that are great for travel? I’d love some new ideas/flavours to try while I’m on my tour. I love this idea!!! YUM. It is quite unfortunate that they are so expensive. I’ll try out this recipe for sure! I just discovered Lara Bars. So far apple pie is my favorite. Pure cocoa? is that cocoa powder? Did you use unsweetened coconut flakes? Great idea and recipe. Perfect for when you’re out of the house and hungry! I can’t wait to make these! I am a huge fan of larabars and since I just started school again I need a filling snack to keep me going from work to school to home and larabars can get expensive if you eat them all.the.time. I can’t wait to make these! I love Larabars, but you’re right, they can get expensive. 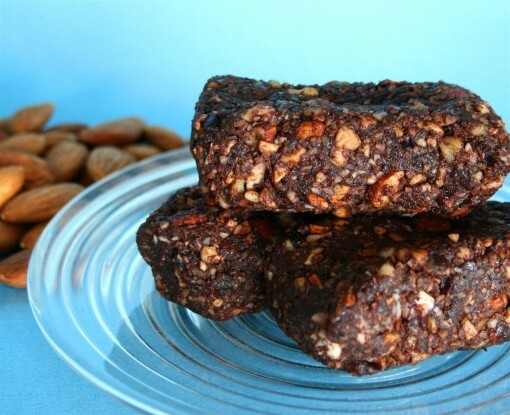 I make my own no-bake protein bars to save money. Can’t wait to make these! How long can they be stored in the fridge? Ellie~ I would say, at least a week! You can always freeze half the batch too! Coconut Creme Pie and Lemon Bar are just the best… Can’t wait to try this recipe! Those look SO yummy!! 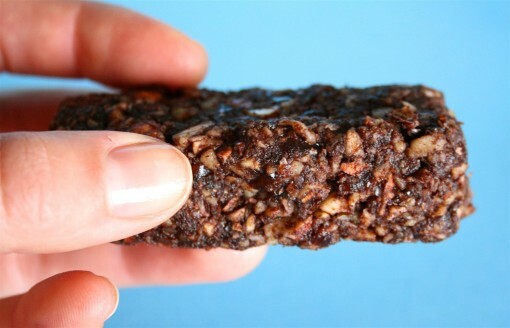 I love Lara bars as well.. so healthy and delicious! My husband and I just embarked on a Paleo lifestyle in January and I’m always looking for great snack ideas. We love Larabars, but they do get expensive. This is a great recipe that i can’t wait to try! Thanks!!! These look so good and the mixture was AMAZING…however, I could not get my dates to mush in food processor. I ended up with coated dates that tasted yummy but not bars. 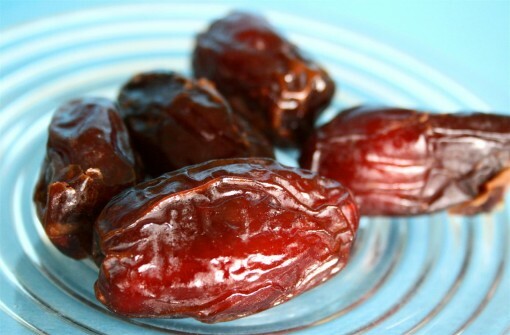 Do I need to soak my dates first? Thanks Kristen and Katie! So glad this recipe helps you in your healthy lifestyle! Tanya – I think soaking them would be a good idea! I used Medjool dates which tend to be very soft and moist. If I’ve using harder dates, yes, I soak them first. Heather~ Just realized I never answered your question, sorry! Yes, pure cocoa is just cocoa…I just buy a brand that is a bit better quality than your regular cocoa from the supermarket. And yes, I used unsweetened coconut flakes! I JUST MADE THESE! I love the bars Cliff came out with that are nut and fruit bars and I wanted to make them so I wouldn’t spend a fortune on them! thank you! I need more recipes like this. How do you keep them from going bad after making them? Would tin foil work? Jessica~ I actually just freeze them (wrapping them in plastic wrap first – I’m sure tin foil would be ok too). Then I take them out as I need them the night before. It’s a fantastic snack for packing my lunches! Glad you’re enjoying! This might be a stupid question, but would you soak the walnuts and THEN measure them, or measure them before soaking them? These bars are very good. Walaa is not a word. Voila is.